Tyrone bounced back to pick up their first league points of the season with a four points win at Castlebar. Peter Harte's second-half goal sealed it for a Red Hand side that led from start to finish. It was a crucial victory for Tyrone who had surrendered a five-point lead at home to Monaghan in their opening game. Mickey Harte's men should feel in much better shape as they go into a three-week break before their next match which is at home to Derry. Tyrone raced ahead with early scores from Darren McCurry and debutant Cathal McShane, and their blanket defensive strategy frustrated their opponents. Jason Doherty got Mayo's first score from a fifth-minute free but Tyrone, breaking at pace, tagged on a couple more through Mattie Donnelly and Sean Cavanagh. Goalkeeper Niall Morgan claimed two points from long-range frees, one of them from 50 metres, as the Red Hands opened out a five-point lead. Mayo shot a rash of wides, and went 21 minutes without a score, before Kevin McLoughlin slotted over a stoppage time free. Tyrone led by 0-8 to 0-4 at the interval, and extended the advantage though Donnelly and McCurry. 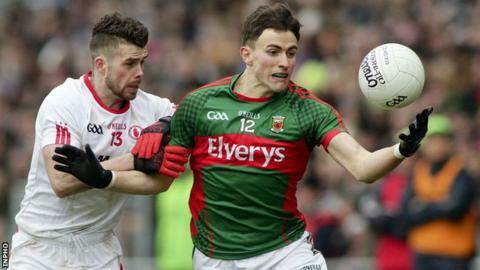 But Mayo grabbed a goal on 50 minutes, substitute Cillian O'Connor slotting the ball into the net from a just yard out after McLoughlin's shot had come back off a post, the goal allowed to stand after referee Eddie Kinsella had consulted with his umpires. Tyrone responded with a goal of their own five minutes later. Sean Cavanagh delivered from deep for substitute PJ Lavery to pick up, and he spotted Harte's run, slipping the ball inside for the untracked wing-back to slide the ball low into the net.